Since I’m waiting for parts for other tables, I was able to do a lot of work on this table over the past week. I was asked to design this as though it was a 60s/70s era table, so the first thing I did was chop the playfield length down from 46″ to 42″. For a while I wasn’t really sure what type of flow this table would have- Should it be nudge based like Target Pool? Or should it have more flow to it like Paragon? Eventually I decided on a more Paragon/Spiderman/Supersonic type of flow. I talked to Mark a lot while I was iterating the table’s design to ensure I was making the thing along the lines of what he wanted. 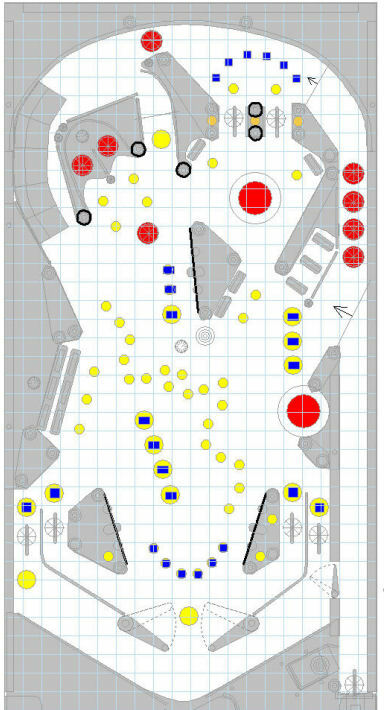 I’ve made the VPT table available for download and play, so please check it out! It’s ~90% scripted, and there are some bugs. 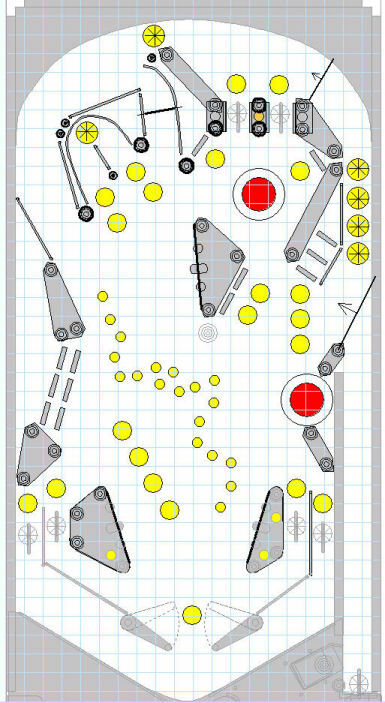 Please remember though, Visual Pinball’s physics are very very very different from real pinball physics. 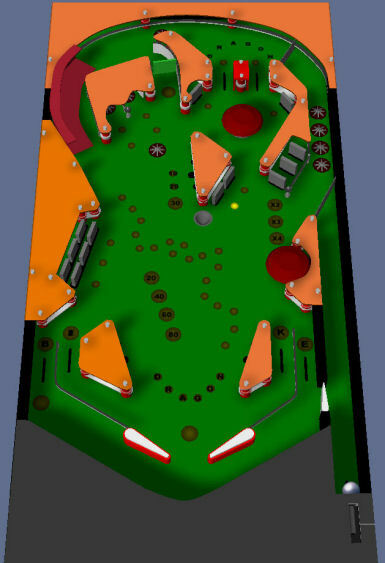 So what may not play well in Visual Pinball, can very possibly play great as a real table. AAAAaand- now for the design progression! This is the first version of the table I have a picture of. There’s a single pop bumper under 2 roll over lanes, the orbit is in place, the spinner is in the centre of the table, and I have a couple targets floating around. There’s also a hidden kicker under the left slingshot plastic (ALA Banzai Run). The nook behind the 3 targets on the left was going to be a saucer kicker of some type. More things are defined in this version. The rollover/bumper area on the top has now been cleaned up. There are now targets to the left and right of the pop bumper. The middle is now defined a bit more. 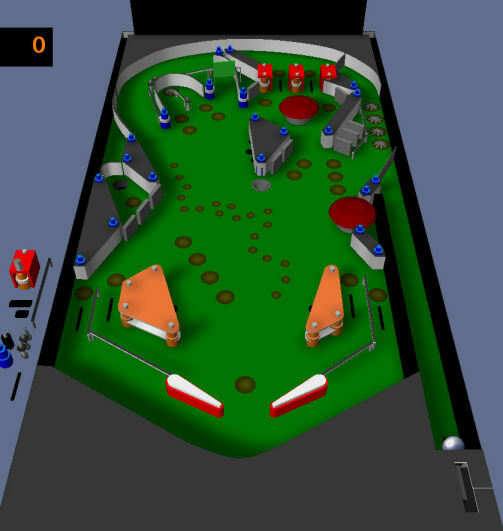 There is a slingshot on the left part of the centre area, a saucer below in the middle of the playfield, and 2 targets on the right side. 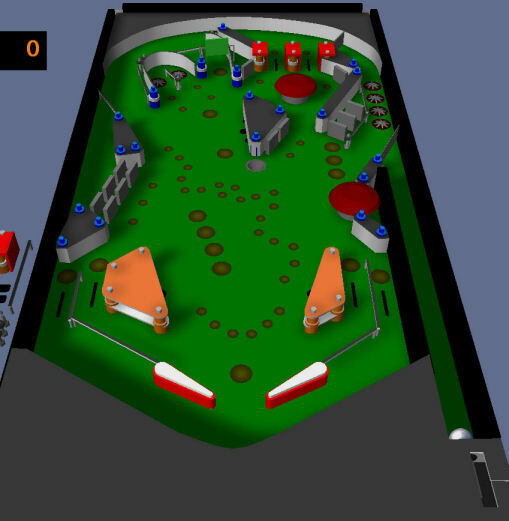 The single target on the right of the playfield (next to the orbit entrance) has been changed to have 2 drop targets and 1 spot target. Many tables in the 70s had this arrangement. The kicker area on the left is more defined now. The kicker under the left slingshot plastic is gone. There were 2 issues with that kicker; 1) It didn’t really go anywhere useful; 2) There really wasn’t enough space for it (and it’s mechanism) to fit over there. 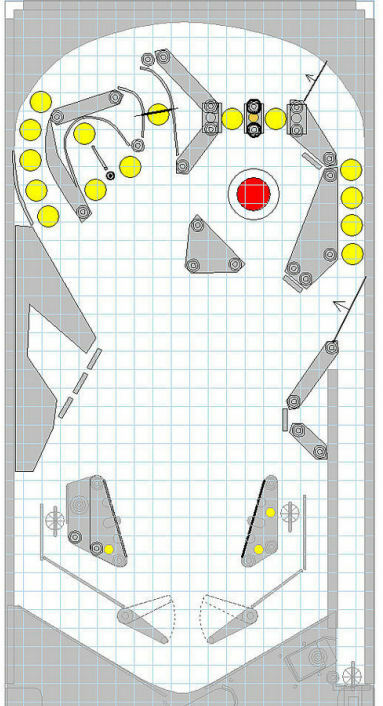 Big things happened to the left part of the playfield! The 3 drop targets and kicker have been replaced with a dual target row. The front row is a set of drop targets, the back row is a set of spot targets. I believe this fits better in this spot then the saucer did. I also feel it’s more enjoyable to have a cluster of targets over here. Other changes are the addition of star-rollover switches around the orbit and around the small horseshoe loop. Not a lot changed here. More lights have been added, and a few minor wall tweaks. At this point I started to seriously think about what each part of the table would represent. Finally, these 2 images show the latest version of the table. At this point, all game modes have been defined and 90% of the scripting is done. 70s era tables are very simple to script in comparison to 90s+ era tables. I’m so impressed with the idea, and being able to watch the progress as this unfolds. The playable download is great!